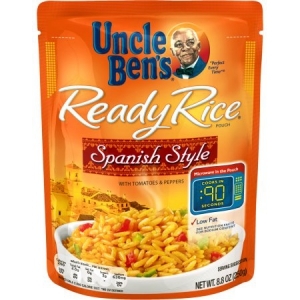 What I like the most about “Uncle Ben’s Ready Rice Spanish Style” is that the rice is both soft and flavorful. I dislike rice that comes out tasting hard, and quite thankfully that’s never a problem I’ve come across with this brand. Every spoonful is smooth in texture in addition to being soft. green pepper pieces and chopped tomatoes into the mix as well as some spices and herbs that give this rice dish a slight garlic and onion taste. Plain rice may be considered bland by some, but I don’t see how any person could claim that this rice dish lacks flavor! The collection of flavors that come from the green peppers, tomatoes, herbs, seasonings and the white rice itself all come together real nicely and provide me with a scrumptious side dish to any meal where meat or chicken is the main course. convenience is a plus, too. In one bag comes to pouches, so one bag is good for two side dishes, unless cooking for more than one person. One bag generally costs around two dollars and thirty cents, which isn’t a bad price at all considering the quality of the rice and the portion size each pouch offers. my favorite rice mixtures from the Uncle Ben’s Ready Rice product line, and a big reason is because of the green peppers. I really like green peppers, and there’s a generous helping of them in each pouch, along with the tomatoes. I’m personally really pleased with this rice and that’s why I’m giving it a “10″ rating.